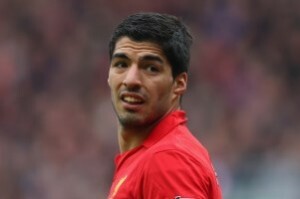 Former Premier League ref Graham Poll insists that Luis Suarez must be banned for seven games over his biting incident. The Liverpool striker’s bite at Chelsea defender Branislav Ivanovic was missed by match officials yesterday. Poll wrote in the Daily Mail: “Luis Suarez should not have been on the field to score the last-gasp equaliser after he disgraced himself and bit Branislav Ivanovic in the second half of the Liverpool v Chelsea game. “The Football Association have failed to punish plenty of wrongdoing over the last few weeks — Daniel Sturridge will be the latest after his nasty, over-the-top challenge on Ryan Bertrand, as it was an ‘on the ball’ tackle.